"Wu Xia" redirects here. For the 2011 Chinese film titled "Wu Xia", see Dragon (2011 film). For the gorge, see Wu Gorge. Wuxia (武俠 [ù.ɕjǎ]), which literally means "martial heroes", is a genre of Chinese fiction concerning the adventures of martial artists in ancient China. Although wuxia is traditionally a form of fantasy literature, its popularity has caused it to spread to diverse art forms such as Chinese opera, mànhuà, films, television series and video games. It forms part of popular culture in many Chinese-speaking communities around the world. The word "wǔxiá" is a compound composed of the elements wǔ (武, literally "martial", "military", or "armed") and xiá (俠, literally "chivalrous", "vigilante" or "hero"). A martial artist who follows the code of xia is often referred to as a xiákè (俠客, literally "follower of xia") or yóuxiá (遊俠, literally "wandering xia"). In some translations, the martial artist is referred to as a "swordsman" or "swordswoman" even though he or she may not necessarily wield a sword. The heroes in wuxia fiction typically do not serve a lord, wield military power, or belong to the aristocratic class. They often originate from the lower social classes of ancient Chinese society. A code of chivalry usually requires wuxia heroes to right and redress wrongs, fight for righteousness, remove oppressors, and bring retribution for past misdeeds. Chinese xia traditions can be compared to martial codes from other cultures such as the Japanese samurai's bushidō tradition. Even though the term "wuxia" as the name of a genre is a recent coinage, stories about xia date back more than 2,000 years. Wuxia stories have their roots in some early youxia tales from 300–200 BCE. The Legalist philosopher Han Fei spoke disparagingly of youxias in his book Han Feizi in the chapter On Five 'Maggot' Classes about five social classes in the Spring and Autumn period. Some well-known stories include Zhuan Zhu's assassination of King Liao of Wu, and most notably, Jing Ke's attempt on the life of the King of Qin (who became Qin Shi Huang later). In Volume 86 of the Records of the Grand Historian (Shi Ji), Sima Qian mentioned five notable assassins – Cao Mo, Zhuan Zhu, Yu Rang, Nie Zheng and Jing Ke – in the Warring States period who undertook tasks of conducting political assassinations of aristocrats and nobles. :17–19 These assassins were known as cike (刺客; literally "stabbing guests"). They usually rendered their loyalties and services to feudal lords and nobles in return for rewards such as riches and women. In Volume 124 of the Shi Ji, Sima Qian detailed several embryonic features of xia culture from his period. These popular phenomena were also documented in other historical records such as the Book of Han and the Book of the Later Han. The modern wuxia genre rose to prominence in the early 20th century after the May Fourth Movement of 1919. A new literature evolved, calling for a break with Confucian values, and the xia emerged as a symbol of personal freedom, defiance to Confucian tradition, and rejection of the Chinese family system. The early 20th century and the period from the 1960s–80s were often regarded as the golden ages of the wuxia genre. Xiang Kairan (pen name Pingjiang Buxiaosheng) became the first notable wuxia writer, with his debut novel being The Peculiar Knights-Errant of the Jianghu (江湖奇俠傳). [ISBN missing] It was serialised from 1921–28 and was adapted into the first wuxia film, The Burning of the Red Lotus Temple (1928). Zhao Huanting (趙煥亭), who wrote Chronicles of the Loyal Knights-Errant (奇俠精忠傳, serialised 1923–27), was another well-known wuxia writer based in Shanghai. Starting from the 1930s, wuxia works proliferated and its centre shifted to Beijing and Tianjin in northern China. The most prolific writers there were collectively referred to as the Five Great Masters of the Northern School (北派五大家): Huanzhulouzhu, who wrote The Swordspeople from Shu Mountains (蜀山劍俠傳); Gong Baiyu (宮白羽), who wrote Twelve Coin Darts (十二金錢鏢); Wang Dulu, who wrote The Crane-Iron Pentalogy (鹤鉄五部作); Zheng Zhengyin (郑証因), who wrote The King of Eagle Claws (鹰爪王); Zhu Zhenmu (朱貞木), who wrote The Seven-Killing Stele (七殺碑). Wuxia fiction was banned at various times during the Republican era and these restrictions stifled the growth of the genre. In spite of this, wuxia writing prevailed in other Chinese-speaking regions, such as Taiwan and Hong Kong. Writers such as Liang Yusheng and Louis Cha (Jin Yong) spearheaded the founding of a "new school" of the wuxia genre that differed largely from its predecessors. They wrote serials for newspapers and magazines. They also incorporated several fictional themes such as mystery and romance from other cultures. In Taiwan, Wolong Sheng, Sima Ling, Zhuge Qingyun (諸葛青雲), Shiao Yi (萧逸) and Gu Long became the region's best known wuxia writers. After them, writers such as Woon Swee Oan and Huang Yi rose to prominence in a later period. Chen Yu-hui is a contemporary female wuxia novelist who made her debut with the novel The Tian-Guan Duo Heroes (天觀雙俠). There have also been works created after the 1980s which attempt to create a post-wuxia genre. Yu Hua, one of the more notable writers from this period, published a counter-genre short story titled Blood and Plum Blossoms, in which the protagonist goes on a quest to avenge his murdered father. A 17th-century woodblock print of a scene from a play on the Kunlun Nu story. Modern wuxia stories are largely set in ancient or pre-modern China. The historical setting can range from being quite specific and important to the story, to being vaguely-defined, anachronistic, or mainly for use as a backdrop. Elements of fantasy, such as the use of magic powers and appearance of supernatural beings, are common in some wuxia stories but are not a prerequisite of the wuxia genre. However, the martial arts element is a definite part of a wuxia tale, as the characters must know some form of martial arts. Themes of romance are also strongly featured in some wuxia tales. A typical wuxia story features a young male protagonist who experiences a tragedy – such as the loss of his loved ones – and goes on to undertake several trials and tribulations to learn several forms of martial arts from various fighters. At the end of the story, he emerges as a powerful fighter whom few can equal. He uses his abilities to follow the code of xia and mends the ills of the jianghu. For instance, the opening chapters of some of Jin Yong's works follow a certain pattern: a tragic event occurs, usually one that costs the lives of the newly introduced characters, and then it sets events into motion that will culminate in the primary action of the story. Other stories use different structures. For instance, the protagonist is denied admission into a martial arts sect. He experiences hardships and trains secretly and waits until there is an opportunity for him to show off his skills and surprise those who initially looked down on him. Some stories feature a mature hero with powerful martial arts abilities confronting an equally powerful antagonist as his nemesis. The plot will gradually meander to a final dramatic showdown between the protagonist and his nemesis. These types of stories were prevalent during the era of anti-Qing revolutionaries. Certain stories have unique plots, such as those by Gu Long and Huang Yi. Gu Long's works have an element of mystery and are written like detective stories. The protagonist, usually a formidable martial artist and intelligent problem-solver, embarks on a quest to solve a mystery such as a murder case. Huang Yi's stories are blended with science fiction. Despite these genre-blending elements, wuxia is primarily a historical genre of fiction. Notwithstanding this, wuxia writers openly admit that they are unable to capture the entire history of a course of events and instead choose to structure their stories along the pattern of the protagonist's progression from childhood to adulthood instead. The progression may be symbolic rather than literal, as observed in Jin Yong's The Smiling, Proud Wanderer, where Linghu Chong progresses from childish concerns and dalliances into much more adult ones as his unwavering loyalty repeatedly thrusts him into the rocks of betrayal at the hands of his inhumane master. The eight common attributes of the xia are listed as benevolence, justice, individualism, loyalty, courage, truthfulness, disregard for wealth, and desire for glory. Apart from individualism, these characteristics are similar to Confucian values such as ren (仁; "benevolence", "kindness"), zhong (忠; "loyalty"), yong (勇; "courage", "bravery") and yi (義; "righteousness"). The code of xia also emphasises the importance of repaying benefactors after having received deeds of en (恩; "grace", "favour") from others, as well as seeking chou (仇; "vengeance", "revenge") to bring villains to justice. However, the importance of vengeance is controversial, as a number of wuxia works stress Buddhist ideals, which include forgiveness, compassion and a prohibition on killing. In the jianghu, martial artists are expected to be loyal to their master (Shifu). This gives rise to the formation of several complex trees of master-apprentice relations as well as the various sects such as Shaolin and Wudang. If there are any disputes between fighters, they will choose the honourable way of settling their issues through fighting in duels. The martial arts in wuxia stories are based on wushu techniques and other real life Chinese martial arts. In wuxia tales, however, the mastery of such skills are highly exaggerated to superhuman levels of achievement and prowess. Martial arts (武功): Fighting techniques in a codified sequence called zhaoshi (招式), which are based on real life Chinese martial arts. Weapons and objects: Combatants use a wide range of weapons in combat. The most commonly used ones are the dao (broadsword or saber), jian (sword), gun (staff), and qiang (spear). Everyday objects such as abaci, benches, fans, ink brushes, smoking pipes, sewing needles, or various musical instruments, are also used as weapons as well. Qinggong: A form of real Chinese martial arts. In wuxia fiction, however, its use is exaggerated to the point that characters can circumvent gravity to fly, cover tremendous distances in a single stride, run across surfaces of water, mount trees, and jump over or scale high walls. Neili (内力; lit "internal force" or "internal strength")/Neigong (內功; literally "internal skill" or "internal function"): The ability to build up and cultivate inner energy known as qi and utilise it for attack and defensive purposes. Characters use this energy to attain skills such as superhuman strength, speed, stamina, durability and healing as well as the ability to project energy beams and elemental forces from their bodies. Dianxue (點穴; literally "touching acupuncture points"): Characters use various acupuncture techniques to kill, paralyse, immobilise or even manipulate opponents by attacking their acupressure points with their bare hands or weapons. Such techniques can also be used for healing purposes, such as halting excessive bleeding. Real life martial artists do use such techniques to paralyse or stun their opponents, however, their effectiveness is highly exaggerated in wuxia stories. In wuxia stories, characters attain the above skills and abilities by devoting themselves to years of diligent study and exercise, but can also have such power conferred upon them by a master who transfers his energy to them. The instructions to mastering these skills through training are found in secret manuals known as miji (秘笈). In some stories, specific skills can be learned by spending several years in seclusion with a master or training with a group of fighters. "Jianghu" redirects here. For other uses, see Jianghu (disambiguation). The meaning of the term jianghu (江湖; jiānghú; gong1wu4; 'rivers and lakes') has evolved over the course of Chinese history, but is usually used to describe the martial arts world of ancient China. 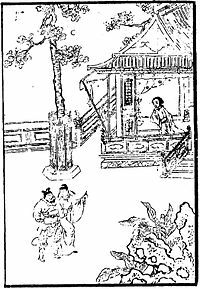 First coined by Zhuangzi in the late 4th century BC, it was used to describe a way of life different from that of being actively involved in politics. At the time, it referred to the way of life of underachieving or maligned scholar-officials who distanced themselves from the circles of political power. In this sense, jianghu could be loosely interpreted as the way of life of a hermit. Over the centuries, jianghu gained greater acceptance among the common people and gradually became a term used to describe a sub-society parallel to, and sometimes orthogonal to, mainstream society. This sub-society initially included merchants, craftsmen, beggars and vagabonds, but over time it assimilated bandits, outlaws and gangs who lived "outside the existing law". During the Song and Yuan dynasties, bards and novelists began using the term jianghu to create a literature of a fictional society of adventurers and rebels who lived not by existing societal laws, but by their own moral principles. The core of these moral principles encompassed xia (俠; 侠; xiá; 'chivalry'), yi (義; 义; yì; 'righteousness'), li (禮; 礼; lǐ; 'virtue'), zhong (忠; zhōng; 'loyalty') and chou (仇; chóu; 'vengeance/revenge'). Stories in this genre bloomed and enriched various interpretations of jianghu. At the same time, the term jianghu also developed intricate interconnections with gang culture because of outlaws' mutually shared distaste towards governments. The inclusion of martial arts as a feature of jianghu was a recent development in the early 20th century. Novelists started creating a fantasy world in jianghu in which characters are martial artists and in which the characters' enforcement of righteousness is symbolised by conflicts between different martial artists or martial arts sects and the ultimate triumph of good over evil. Martial arts became a tool used by characters in a jianghu story to enforce their moral beliefs. On the other hand, there are characters who become corrupted by power derived from their formidable prowess in martial arts and end up abandoning their morality in their pursuit of power. Around this time, the term jianghu became closely related to a similar term, wulin (武林; wǔlín; mou5lam4; 'martial forest'), which referred exclusively to a community of martial artists. This fantasy world of jianghu remains as the mainstream definition of jianghu in modern Chinese popular culture, particularly wuxia culture. The following description focuses more on the martial arts aspect of jianghu, its well-established social norms, and its close relation with "wulin". A common aspect of the jianghu is that the courts of law are dysfunctional and that all disputes and differences (within the community) can only be resolved by members of the community, through the use of mediation, negotiation or force, predicating the need for the code of xia and acts of chivalry. Law and order within the jianghu are maintained by the various orthodox and righteous sects and heroes. Sometimes these sects may gather to form an alliance against a powerful evil organisation in the jianghu. A leader, called the "wulin mengzhu" (武林盟主; literally "master of the wulin alliance"), is elected from among the sects in order to lead them and ensure law and order within the jianghu. The leader is usually someone with a high level of mastery in martial arts and a great reputation for righteousness who is often involved in some conspiracy and/or killed. In some stories, the leader may not be the greatest martial artist in the jianghu; in other stories, the position of the leader is hereditary. The leader is an arbiter who presides and adjudicates over all inequities and disputes. The leader is a de jure chief justice of the affairs of the jianghu. Members of the jianghu are also expected to keep their distance from any government offices or officials, without necessarily being antagonistic. It was acceptable for jianghu members who are respectable members of society (usually owning properties or big businesses) to maintain respectful but formal and passive relationship with the officials, such as paying due taxes and attending local community events. Even then, they are expected to shield any fugitives from the law, or at the least not to turn over fugitives to the officials. Local officials who are more savvy would know better than to expect co-operation from jianghu members and would refrain from seeking help except to apprehend the worst and most notorious criminals. If the crimes also violated some of the moral tenets of jianghu, jianghu members may assist the government officials. An interesting aspect is that while senior officials are kept at a distance, jianghu members may freely associate with low-ranking staff such as runners, jailers, or clerks of the magistrates. The jianghu members maintained order among their own in the community and prevent any major disturbance, thus saving a lot of work for their associates in the yamen. In return, the runners turn a blind eye to certain jianghu activities that are officially disapproved, the jailers ensured incarcerated jianghu members are not mistreated, and the clerks pass on useful tips to the jianghu community. This reciprocal arrangement allowed their superiors to maintain order in their jurisdiction with the limited resources available and jianghu members greater freedom. Although many jianghu members were Confucian-educated, their attitudes towards the way of life in the jianghu is largely overshadowed by pragmatism. In other words, they feel that Confucian values are to be respected and upheld if they are useful, and to be discarded if they are a hindrance. No using of dirty tricks such as eye-gouging during fights unless one has a personal feud with the opponent. Personal feuds do not extend to family members. Always show respect for seniors and elders according to their status or age. Complete obedience to one's shifu (martial arts teacher). No learning of martial arts from another person without prior permission from one's shifu. No using of martial arts against those who are not trained in martial arts. No sexual relationships with the wives of friends. One's word is one's bond. The term jianghu is linked to cultures other than those pertaining to martial arts in wuxia stories. It is also applied to anarchic societies. For instance, the triads and other Chinese secret societies use the term jianghu to describe their world of organised crime. Sometimes, the term jianghu may be replaced by the term "underworld" à la "criminal underworld". In modern terminology, jianghu may mean any circle of interest, ranging from the entertainment industry to sports. Colloquially, retirement is also referred to as "leaving the jianghu" (退出江湖). In wuxia stories, when a reputable fighter decides to retire from the jianghu, he will do so in a ceremony known as "washing hands in the golden basin" (金盆洗手). He washes his hands in a golden basin filled with water, signifying that he will no longer be involved in the affairs of the jianghu. When a reclusive fighter who has retired from the jianghu reappears, his return is described as "re-entering the jianghu" (重出江湖). 金庸 1955–72 The Book and the Sword, Condor Trilogy, Demi-Gods and Semi-Devils, The Smiling, Proud Wanderer, The Deer and the Cauldron The most popular, and regarded by some as the most accomplished, writer to date. His works have been adapted into films and television series numerous times. 梁羽生 1955–84 Qijian Xia Tianshan, Datang Youxia Zhuan, Baifa Monü Zhuan, Saiwai Qixia Zhuan, Yunhai Yugong Yuan, Xiagu Danxin The pioneer of the "new school" wuxia genre. Some of his works were adapted into films and television series. 古龍 1960–84 Chu Liuxiang Series, Juedai Shuangjiao, Xiao Shiyi Lang, Xiaoli Feidao Series, Lu Xiaofeng Series A writer who blends elements of mystery in his works. He writes in short paragraphs and is influenced stylistically by Western and Japanese writers. Some of his works were adapted into films and television series. 溫瑞安 1973–present Si Da Ming Bu, Buyi Shenxiang, Jingyan Yi Qiang His works were adapted into the television series The Four and Face to Fate, and the film The Four. 黃易 1987–2017 Xunqin Ji, Fuyu Fanyun, Datang Shuanglong Zhuan Combines wuxia with science fiction in his works. His works were adapted into the television series A Step into the Past, Lethal Weapons of Love and Passion and Twin of Brothers. New and original wuxia writings have dwindled significantly in modern times, particularly so as patronage and readerships of the genre decimated due to readily available alternatives in entertainment such as DVDs, gaming consoles and so forth. The genre has proliferated in manhua (Chinese comics) in places like Hong Kong and Taiwan, with the core essentials of the wuxia genre living on in weekly editions equivalent to the Japanese manga. 馬榮成 1980s–present Fung Wan, Chinese Hero, Black Leopard Some of his works were adapted into films and television series such as The Storm Riders, Wind and Cloud, The Blood Sword, and A Man Called Hero. 黃玉郎 1980s–present Oriental Heroes, Weapons of the Gods, Legend of Emperors, Buddha's Palm Some of his works were adapted into films and television series like Dragon Tiger Gate, Kung Fu VS Acrobatic, and The Buddhism Palm Strikes Back. The earliest wuxia films date back to the 1920s. Films produced by King Hu and the Shaw Brothers Studio featured sophisticated action choreography using wire and trampoline assisted acrobatics combined with sped-up camera techniques. The storylines in the early films were loosely adapted from existing literature. Cheng Pei-pei, Jimmy Wang and Connie Chan are among the better known wuxia movie stars in the 1960s–70s, when films made by King Hu and the Shaw Brothers Studio were most prominent. More recent wuxia movie actors and actresses include Jet Li, Brigitte Lin, Michelle Yeoh, Donnie Yen, Tony Leung and Zhang Ziyi. Yuen Woo-ping is a choreographer who achieved fame by crafting action-sequences in wuxia films. Wuxia was introduced to Hollywood studios in 2000 by Ang Lee's Crouching Tiger, Hidden Dragon, though influence of the genre was previously seen in the United States in the 1970s television series Kung Fu. Following in Lee's footsteps, Zhang Yimou made Hero, targeted for the international market in 2003, House of Flying Daggers in 2004 and Curse of the Golden Flower in 2006. Western audiences were also introduced to wuxia through Asian television stations in larger cities, which featured miniseries such as Warriors of the Yang Clan and Paradise, often with English subtitles. Western attempts at the genre have been limited, such as the 2008 film The Forbidden Kingdom, which starred Jackie Chan, Jet Li and Michael Angarano. However, a major exception is DreamWorks Animation's media franchise Kung Fu Panda. Created as an earnest, if humorous, emulation by producers who were knowledgeable admirers of the genre, the series has been particularly hailed in China as an excellent contribution to the form. More recently, 1990s–2000s Hong Kong stars Daniel Wu and Stephen Fung have worked with AMC Networks to bring wuxia to a US television audience with Into the Badlands, which premiered in 2015 and has since been renewed for second and third seasons. Some notable wuxia video games of the action RPG genre include The Legend of Sword and Fairy, Xuan-Yuan Sword, Jade Empire, and Kingdom of Paradise, all of which blend wuxia with elements of Chinese mythology and fantasy. The Legend of Sword and Fairy, in particular, expanded into a franchise of eight video games, two of which were adapted into the television series Chinese Paladin (2005) and Chinese Paladin 3 (2009). There are also MMORPGs, such as Heroes of Kung Fu and Age of Wulin, and hack and slash games, such as Bujingai and Heavenly Sword. Games adapted from the works of wuxia writers include Heroes of Jin Yong, an RPG based on characters in Jin Yong's novels; Dragon Oath, an MMORPG inspired by Jin Yong's Demi-Gods and Semi-Devils; and Martial Kingdoms, a strategy game featuring several martial arts sects which commonly appear in wuxia fiction. ^ a b c d e Teo, Stephen (2009). Chinese Martial Arts Cinema: The Wuxia Tradition. Edinburgh: Edinburgh University Press. ISBN 9780748632862. ^ Sima, Qian. "卷八十六 刺客列傳 第二十六 [Volume 86: Biographies of Assassins]". Shi Ji [Records of the Grand Historian] (in Chinese) ([Reproduced on Chinese Wikisource] ed.). Retrieved 25 December 2014. ^ "唐人傳奇 - 聶隱娘 [Tang Dynasty Legends - Nie Yinniang]". 中華武俠文化網 [Chinese Wusia [sic] Knight-errant] (in Chinese). Overseas Chinese Affairs Commission Taiwan, Republic of China. Retrieved 25 December 2014. ^ a b Liu, Damu; Lau, Shing-hon; Leong, Mo-Ling (1996). A Study of the Hong Kong Swordplay Film (1945–1980). Hong Kong: Urban Council of Hong Kong. ISBN 9627040517. ^ a b c Hamm, John Christopher (2006). Paper Swordsmen: Jin Yong and the Modern Chinese Martial Arts Novel (Paperback ed.). Honolulu: University of Hawaii Press. ISBN 082482895X. ^ a b c d "An Introduction to the Wuxia Genre". Heroic-cinema.com. Retrieved 28 December 2013. ^ Doleželová-Velingerová, Milena (1988). Selective Guide to Chinese Literature 1900-1949: The Novel. Leiden: E.J. Brill. pp. 176–177. ISBN 9004078800. ^ Liu, James J. Y. (1976). The Chinese Knight Errant. London: Routledge & Kegan Paul. pp. 135–136. ^ Xu, Yaping (9 November 2011). "平江不肖生的传奇生涯(二) [The Life of Pingjiang Buxiaosheng (Part 2)]". 中国国学网 [confucianism.com.cn] (in Chinese). China: Hunan Daily. Retrieved 25 December 2014. ^ "北趙: 趙煥亭 [Zhao of the North: Zhao Huanting]". 中華武俠文化網 [Chinese Wusia [sic] Knight-errant] (in Chinese). Overseas Chinese Affairs Commission Taiwan, Republic of China. Retrieved 25 December 2014. ^ "民初舊派武俠作家 ['Old School' Wuxia Writers of the Early Republican Era]". 中華武俠文化網 [Chinese Wusia [sic] Knight-errant] (in Chinese). Overseas Chinese Affairs Commission Taiwan, Republic of China. Retrieved 25 December 2014. ^ Li, Junjie (29 August 2007). "台湾"女金庸"坐月子写巨著 [Taiwan's "Female Jin Yong" wrote her masterpiece in her post-pregnancy period]". 世界新闻报 [World News Journal] (in Chinese). Retrieved 25 December 2014. ^ a b McNeil, Simon. "The Anatomy of a Wuxia Novel". Kung Fu Magazine. Retrieved 25 December 2014. ^ Elizabeth Reninger. "Qing Gong". About.com. Retrieved 11 September 2015. ^ the13th, friday. "Jianghu: A World of Martial Arts". SPCnet.TV. Retrieved 20 July 2017. ^ Barboza, David (30 June 2008). "Kung Fu Panda is a success at the box office in China". International Herald Tribune. Retrieved 9 July 2017. ^ Lee, Min (3 July 2008). "Kung Fu Panda reaches Chinese box office milestone". USA Today. Retrieved 28 December 2013. ^ Yang, Jeff (23 November 2015). "Into the Badlands' Daniel Wu Is the Asian American Action Hero That Bruce Lee Should've Been". Slate. Retrieved 9 July 2017. ^ Tierney, Sean (18 May 2017). "Into the Badlands – Interview with Daniel Wu". JetLi.com. Retrieved 9 July 2017. ^ "Age of Wulin – Legend of the Nine Scrolls is set in medieval China and based on the lore surrounding martial arts". Wulin.gpotato.eu. Retrieved 28 December 2013. ^ Purchese, Robert (19 November 2009). "Eurogamer Enslaved Interview". Eurogamer. Retrieved 15 March 2015. McCloud, Aaron Matthew Gordon. 2010. "Papercuts: The Literary and the Martial in the Genre of Wuxia Fiction". Thesis (B.A.) – Reed College, 2010. (in Polish) Wuxia, sztylety i wielka miłość. O filmie "Dom Latających Sztyletów"